September 11, 2001 will be marked by historians as a watershed event in American history, for many reasons.Â One reason, though hardly the most important, has brought many changes to the G.I. Bill® and the educational options available to members of the armed forces and military veterans.Â Recognizing both the changes in military service created by the onset of the age of terrorism, and the changing nature of the American economy, the Post-9/11 Veterans Education Assistance Improvements Act of 2010 has modified the G.I. Bill to include new categories of eligibility and funds dispersal. On October 1, 2011, current eligible members of the American military and military veterans can use their G.I. Bill funds not just for traditional two- and four-year colleges, but also for non-college degree programs, on-the-job and apprenticeship training, flight programs, and correspondence training. This is good news for those servicemembers currently serving in the armed forces and veterans interested in pursuing the many different options for higher education, many of which are available in online formats. The Servicemen's Readjustment ActÂ Â of 1944 is popularly known as the G.I. Bill of Rights because it was designed to assistÂ all soldiers who served in World War II, whose uniforms, weapons, food was all "Government Issue"—which is where the abbreviation "G.I." came from.Â The G.I. Bill of Rights, signed into law Â by Congress on June 22, 1944, was extended several times, and continues to exist with timely revisions.Â It has helped generations of veterans purchase homes, start businesses, and go to college; according to Time.com, "in 1947, veterans made up almost half the nation's college students." Americans have traditionally supported the G.I. Bill as a way of rewarding the dedication of those who completed military service, but today many of those who benefit are also currently serving in the military. According to the Department of Defense, in 2008 alone, U.S. taxpayers funded 400,000 active duty personnel, to the tune of $474 million in subsidized tuition. This is largely due to the accessibility of college education through online formats.Â The recent changes to the G.I. Bill will now enable even more active servicemembers and veterans to continue the G.I. Bill's tradition of helping improve their lives after their service ends.Â Of particular interest is the Yellow Ribbon Program, which provides even more funding opportunities. 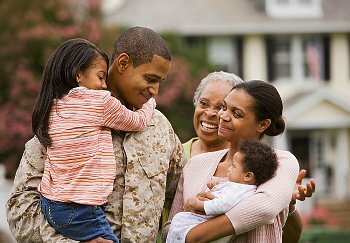 If you are in the Army, Army Reserve, or National Guard, you can access GoArmyEd.com, a huge database sponsored by the U.S. Army, for information on financial assistance and virtually any program. The University of Phoenix is currently the college that enrolls the most veterans. It has a specific military division of 1000 employees dedicated specifically to supporting both currently serving servicemembersÂ and veterans in both their online programs and at physical locations in Europe and Asia. They offer flexible financial programs and even offers scholarships to eligible veterans, which in 2012 will rise to a maximum of $7000 per student. Also, Phoenix is an approved college for the Military Spouse Career Advancement Accounts (MyCAA) program. Through the MyCAA program, military spouses can receive up to $4,000 in financial assistance for many different licenses, certificates, and some Associates Degrees. Kaplan University belongs to the Servicemembers Opportunity Colleges (SOC) consortium. It offers military students reduction in tuition and fee waivers and also accepts military credits earned by students through successful completion of DANTE and CLEP exams. Like Phoenix, Kaplan provides support through its staff of trained advisors, and has a flexible withdrawal policy for military students if they experience a change of orders. American Military UniversityÂ is a regionally accredited school founded by a former member of the Marine Corps and is focused exclusively on meeting some of the unique needs of service personnel. It offers over 100 degree and certificate programs in fields such as liberal arts, education, business administration, criminal justice, and many fields related to military subjects, such as national security, intelligence, and homeland security. AMU students do not have to pay for textbooks, because the university established a book grant to pay for those materials. Ashford University's specialized military enrollment program is staffed largely by former members of the military who have personal experience with many of the issues military students face. It is also accredited and is a member of the Servicemembers Opportunity Colleges (SOC) consortium, and has also been named a "Top Military Friendly School" in by several military service publications.Â As a Letter-of-Instruction (LOI) school in the GoArmyEd program, it offers many different bachelor degree programs, from various business programs to Education, Applied Linguistics, and Health and Human Services, as well as liberal arts degrees in fields including History, Sociology, and Psychology. The Post- 9/11 Veterans Education Assistance Improvements Act of 2010 is the latest revision of the G.I. Bill and enables active service-membersÂ and veterans to take advantage of new online opportunities to pursue higher education.Â According to the Commander in Chief of the Armed Forces, President Obama, the Post-9/11 G.I. Bill will help alleviate some of the problems that have plagued veterans, such as unemployment and homelessness, by improving their educational options. Former and current military personnel often experience an enormous amount of sacrifice; getting a good education should not be one of those sacrifices. If you are a veteran or are currently serving in the armed forces, as you consider your options for higher education, you may also want to check out MilitaryMBA's First-Year Progress Report of the new G.I. Bill here. For information on how to access your G.I. Bill benefits, you can go to the Department of Veterans Affairs website.